Ages ago, I got into quilting. What actually happened is that I got kicked out of school because of eejitry and ignorance and was forced to take a year off. In that time I was working and whatnot, but I had some more time on my hands than usual, not to mention some bone-crushing depression, so I picked up a new hobby. I had the brains to bring my Sewing machine up to Humboldt with me, so I had machine, material and mad skills. Ok, maybe not the skills, but that’s when I started. I made a sampler quilt to try some skills, and a Little Red Schoolhouse quilt. Both using scraps. All scraps–since I didn’t really have any funds to buy more material at the time. and I made it work. And I quilted them both both by hand, because I knew no other way. Long, LONG hours quilting and contemplating and realizing the direction I need my life to move toward. A Lot of love and energy went into those quilts, and I loved them. I loved them hard. these schoolhouses ROCKED! oh, i miss you puffy quilt! Oddly enough, I don’t have either of them anymore. I have NO IDEA what happened to that first one, and the second one got left at the hospital where I delivered Benji. Losing that second one was a heartbreak, but I know some family somewhere is benefiting, so I don’t mind. Anywhoozles, I started piecing quilt tops again a few years ago, honing the skills, learning a few new things, and using up those scraps. Because here’s the thing–I LOVE using up the scraps. now, some of those most stunning quilts I have seen have been made with particular color schemes and bundles and amazing stuff. 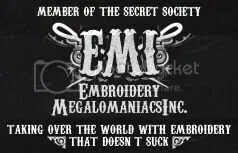 And I’ve even purchased material to perhaps match or contrast a particularly large set of scraps I might have. But the quilt top I just finished? ALL SCRAPS. There is something of the thrifty pioneer in me, I suppose. I have a quilt my great grandmother made–also scrappy, because that’s how one made quilts back then. and it is well loved. 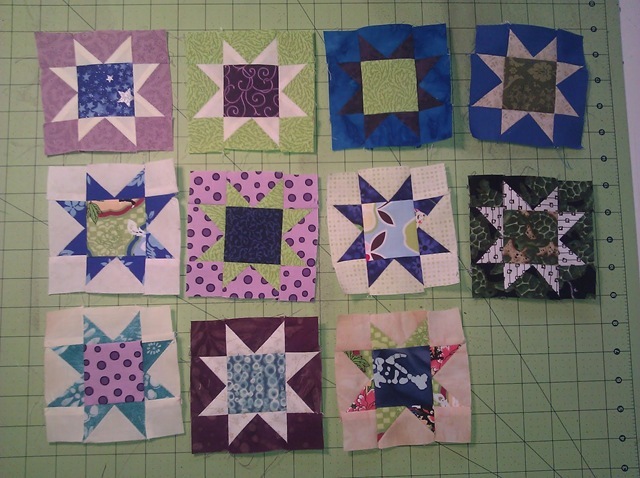 I just love the idea that we (quilters) can take all these pickety bits and make something that will warm someone on a cold night. And comfort them. With very little waste. It SINGS to my frugal soul. 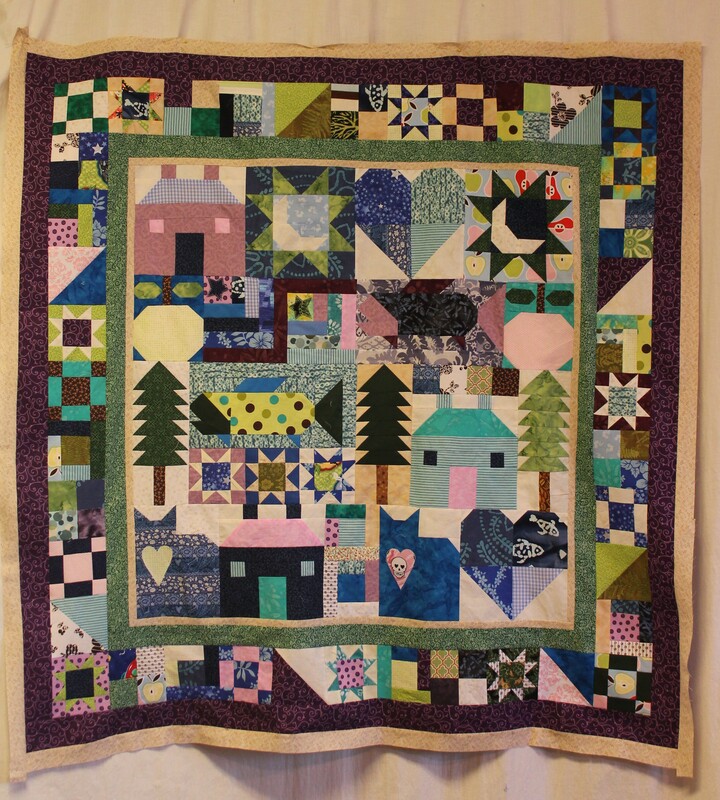 I followed along with a Debbie Mumm Block of the month quilt because, while I am not a Mumm material fan, I really liked the blocks and look of this quilt. And as I had a rather extravagant amount of blue and green scraps, I thought it would be a perfect choice. And oddly enough, it really was. 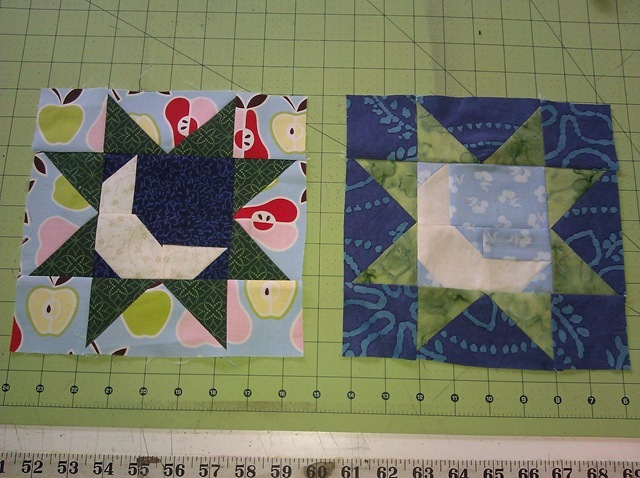 The thing about BOMs (block of the month) is that when you do it scrappy, they don’t always work. And I was pretty unsure of this one. the small border blocks really weren’t reading well in my eye, and I thought, this is just going to be a muddy mess of color. but it turned out that parts of it really popped. and it has the folky feel that I like, without the “country” look that I don’t. It reminds me of Northern CA, where I learned to quilt, with the tree and salmon blocks. 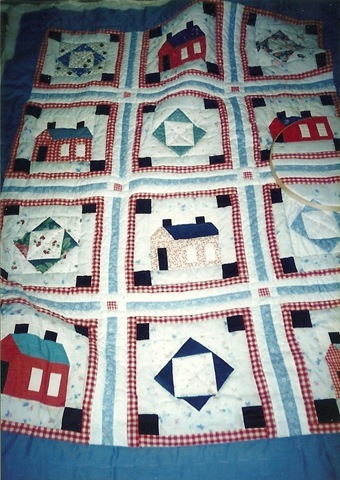 And I may hand quilt it just because it reminds me of those two quilts that I learned on–both piecing and quilting. 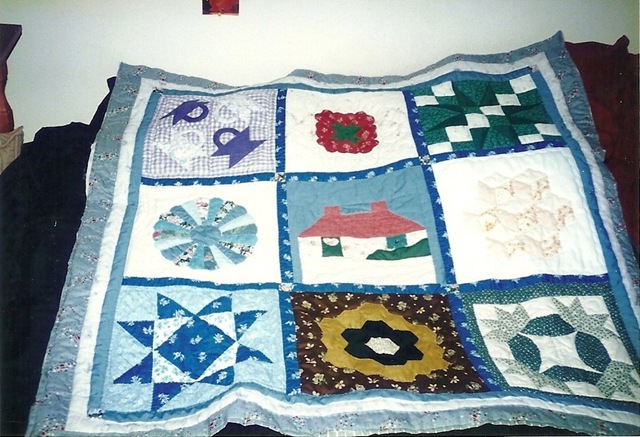 Great story, thanks for sharing and I love that your quilts are genuinely scrappy.